The orange- yellow, oblong star fruit, ribbed to represent stars in its sliced portions, is also known by its scientific name, Averrhoa carambola. It thrives in the heat and humidity of the tropical climate. The surface of the fruit is waxy with a few seeds in the centre of the pulpy flesh of some of the varieties of star fruit. Its tart flavour makes it a rare ingredient except in select dishes. Depending on the variety, however, the fruit may range from very sour to mildly sweet. Therefore, the level of sweetness dictates its inclusion in fruit salads, fruits juices, cocktails and whether it is chosen to be eaten alone. The sour varieties are used to flavour meats, curries, stews and seafood. Jams, chutneys, pickles, sauce and tarts are made from star fruits too. The fruit is an easily perishable food and at room temperature can survive for two to three days. When refrigerated, its shelf life is prolonged. The star fruit is an extremely low calorie food with only 31 calories to 100 grams of the fruit. It provides a good deal of dietary fibre which checks the absorption of LDL cholesterol and protects the mucous lining of the colon from cancerous substances. Vitamin C and flavonoids are abundant in star fruits, providing much desired antioxidants. The fruit contains a substantial amount of metabolism aiding B complex vitamins. Its ability to enhance metabolism and facilitate circulation of nutrients makes star fruit and ideal food for glowing skin and healthy hair. The presence of folic acid helps reduce the risk of heart disease and strokes. 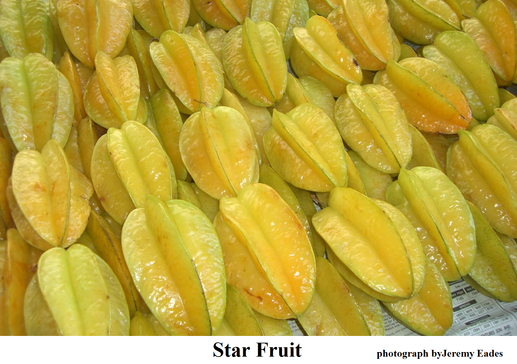 Star fruits are used as home remedies for sunburns, acne, hangovers, ulcers, eczema, cough, fever and sore throat. It has antimicrobial properties that make it useful in fighting E.coli and salmonella infections. If under medication, be warned that star fruit has the capacity to react with some drugs, leading to adverse effects. Star fruits can impair the absorption and metabolism of some natural minerals such as magnesium and calcium because of the high content of oxalic acid. It can also create conditions for a disease called oxaluria wherein oxalate kidney stones are formed. Its consumption may possibly lead to renal failure in persons suffering from kidney problems. Ingredients: 1 tbsp of black lentils, 1 tsp of fenugreek, 1 tbsp of sunflower/ coconut oil, ¼ tsp of asafoetida, 2 pinches of mustard seeds, ¼ tsp of turmeric powder, 3-4 red chillies, 1 cup of coconut paste, 1-2 star fruits, salt and sugar to taste. Preparation: Roast the black lentils, chillies and turmeric in a frying pan. Grind the mixture and add 2 cups of water, coconut paste, star fruits, and salt and sugar according to taste. Heat oil in another frying pan and when it is hot, add mustard seeds, asafoetida and the mixture above. Cook it for ten minutes. Ingredients: 2 potatoes, 1 tomato, 2 cups of medium sized cauliflower florets, 1/2cup of chopped beans, 1 tsp of garam masala, ¼ tsp of turmeric powder, ½ cup of coconut paste, 2 pinches of mustard seeds, sugar and salt to taste. Preparation: Cut all the vegetables into medium sized pieces. Heat a teaspoon of oil in a non-stick deep frying pan. Add mustard seeds, turmeric powder and curry leaves to the frying pan. Put in all the vegetables and 4 cups water. When it boils, add the coconut paste and garam masala. Add sugar and salt according to taste and cook for ten minutes. 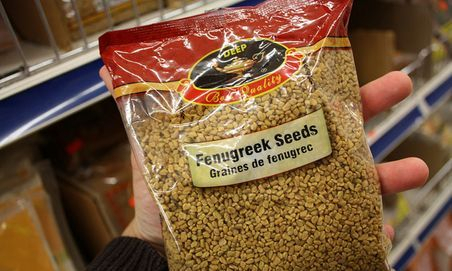 Angina Pectoris: Boil one teaspoon of fenugreek seeds in one and a half cups of water. Strain and add two teaspoons of pure honey. Take this mixture twice daily for six months. Alternate the course of treatment with a gap of six months of abstention from the same.